Salt has been used as a home cleaning product for centuries. It is a cheap and non-toxic disinfectant, which is safe to use and provides amazing results. On the other hand, commercial household cleaners are loaded with dangerous chemicals which endanger our health and the health of our family. 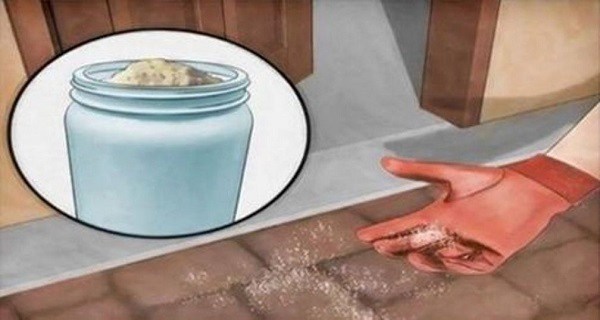 To eliminate ants from your home and stop them from reappearing on the windows, kitchen cabinets, and doors, just sprinkle a bit of salt on the areas. This will also reduce the moisture and humidity in the home. Add a couple of tablespoons of salt in a gallon of lukewarm water, stir, and use the mixture to clean the persistent stains on the windows. Polish them until you make them shiny. You can clean the car windows in the same way, and what’s best, the effects will last long. To prevent your copper, brass, and silver decorations lose their color, mix some apple cider vinegar and salt and wipe them to remove the stains and dirt and restore their shine. Add some salt to hot water and use this mixture to unclog the kitchen and bathroom sink. It will remove the grease and the strong smell as well. To prevent shrinking, and make your clothes soft and clean, pour some salt in the last wash. This is especially useful if you are drying pieces of clothes out on a sunny day. Prepare some concentrated salt water, and soak a cloth in it. Then, rub the carpets, curtains, and rugs to eliminate the dirt and stains, and make them look as new! Add a bit of salt in a glass of warm water and rinse the mouth with the solution. This will serve as a natural mouthwash and it can help you in the case of mouth sores or a toothache. Mix salt and baking soda in equal amounts to prepare a homemade tooth-whitening product. It will restore the natural shine of your teeth and give you a white pearly smile! Mix some salt and lavender essential oil or olive oil to prepare a homemade rejuvenating bath scrub. Apply it on the skin, leave it to act for a few minutes, and then wash it off with lukewarm water. This will remove the dirt, exfoliate, and rejuvenate the skin.